Cheesy Bean Dip made with real cheddar cheese (instead of Velveeta), cream cheese, sour cream, chili beans, and taco seasoning. Also known as Texas Trash, serve this bean dip with tortilla chips and you’ve got yourself the perfect appetizer! 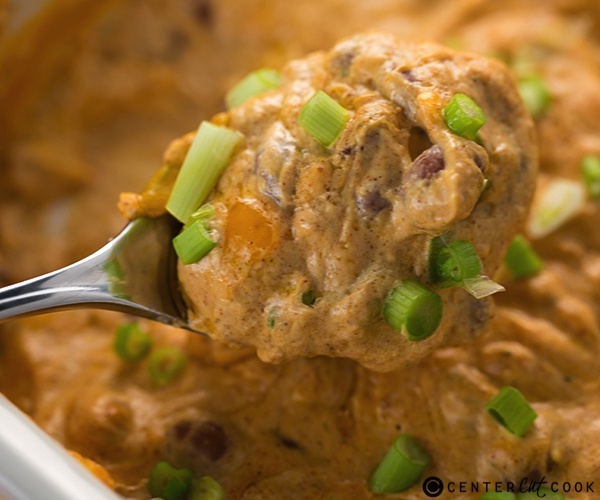 There are a ton of recipes floating around out there for a bean dip made with Velveeta. While I’m sure it’s super delicious, I wanted to try making a Cheesy Bean Dip with real cheddar cheese instead of the Velveeta which is how this recipe came to be. 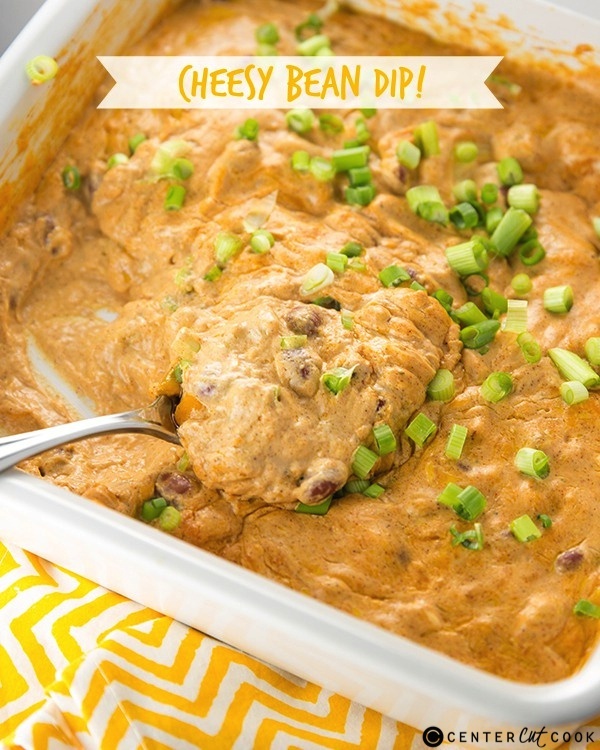 I combined some of favorite dip ingredients including creamy cream cheese and sour cream to form the base of this dip, then added in taco seasoning, chili beans and lots of cheddar cheese. 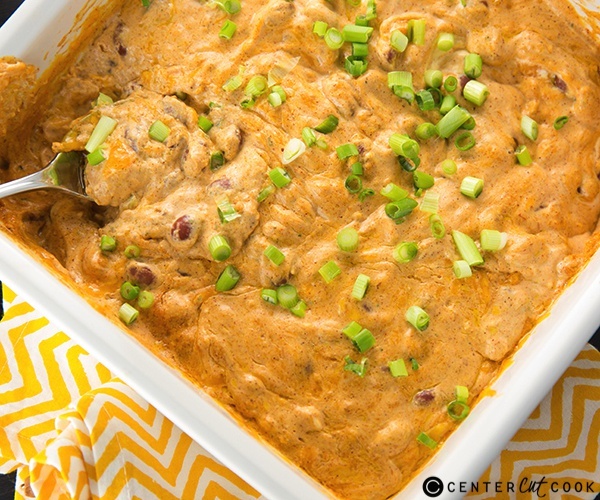 Once it’s baked, this Cheesy Bean Dip will be one of those appetizers that everybody loves and asks you to make over and over again. The best part about this recipe? It is SO easy to make! You literally just combine all of the ingredients, pop it in the oven (or microwave if you’re short on time) until it’s bubbly and melted and you’re good to go! I like to sprinkle green onion on top for garnish, but you could also serve it as is. The combination of the cream cheese and sour cream makes the perfect base for the dip, and I just love the spice that comes from adding in a packet of taco seasoning (or homemade taco seasoning!) and chili beans. I usually buy Bush’s Chili Beans in either mild or medium sauce. You can bake this dip in an 8 x 8 inch or 9 x 9 inch pan, or you can also use a standard 9 inch pie plate. 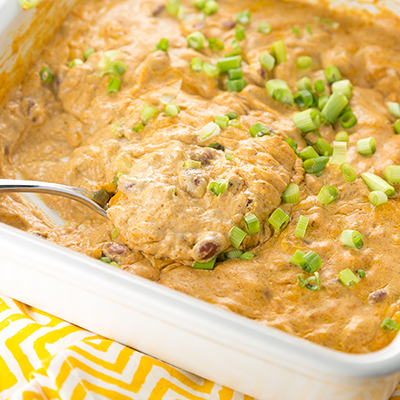 With only 4 ingredients, Cheesy Bean Dip comes together pretty quickly. There are a couple of variations you can try, if you’d like. One variation is to use two cans of refried beans. Another variation I’ve seen is to add about 1 cup of salsa. I didn’t have salsa on hand so I didn’t add it. It’s great either way! Enjoy! Pre-heat your oven to 350 degrees and spray a 2 quart casserole dish with non-stick cooking spray. Combine sour cream, cream cheese, and taco seasoning with a mixer. When well combined, stir in chili beans or refried beans. You can also stir in salsa at this point, if you’d like. Stir in shredded cheddar cheese, then pour the dip into your prepared baking dish. Bake for about 30 minutes, or until the mixture is heated through and the cheese is melted. You can also microwave for about 5 minutes, stirring every couple of minutes. Baking provides the best result.